The latest Trending Now in Cancer Care Survey conducted by the Advisory Board provides a needed lens into the perspective of how cancer programs at several medical institutions, primarily non-teaching community hospitals, evaluate their resources, strategies, goals, and progress. With over half of respondents serving as administrative directors at their institutions, the data collected late last year sheds light on the strides and challenges in cancer care for this year. EHRs and interoperability were heavily emphasized in survey results while a goal of health literacy was clearly outlined as a strategy to tackle healthcare access inequalities. A lack of telehealth usage for providing second opinions was also a topic worthy of exploring. EHR interoperability was reported to be the most concerning IT challenge for several cancer programs with 82% of respondents utilizing more than 1 EHR platform at their facilities. Having to navigate multiple platforms directly affects the patient experience and the patient/physician dynamic; 80% of respondents expressed that the EHR systems at their institutions have caused an increased workload for physicians and employees. More than half reported that their staff spends less time with their patients as a result of their EHR protocol. One strategy that some have implemented to manage multiple EHR platforms is to deploy a cloud management system that image-enables the EHR, providing a single-sign-on experience and holistic patient record. 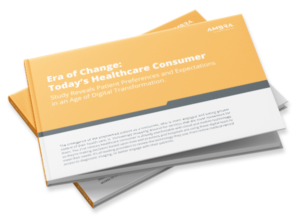 Check out this ebook to learn more about ways to improve EHR systems. As a patient, have you ever struggled to understand advice or a report from your physician? Health literacy is an important topic with 73% of survey respondents reporting that their institutions were focusing on a strategy to address health care inequalities. In order for patients to feel that they are the focus of their experience, it is not only important for their results and diagnosis to be simplified, but also that they have access to their medical data and images. Patient portals that have explanations in lay language can serve as an easy way for patients to navigate and have ownership of their information; a crucial step in making health literacy a reality for all patients. Lastly, the Cancer Care Survey highlighted the fact that cancer programs aren’t fully embracing how telehealth services can play a role in providing second opinions. Only 12% of respondents currently offer second opinions via telehealth, 19% plan to within the next two years, and 69% have no plans to offer second opinions via telehealth. Considering that second opinions are integral to the field of oncology, why don’t more hospitals take advantage of offering them through digital services? Second opinion portals through cloud management systems can help telehealth providers communicate images and reports more efficiently to their patients. A second opinion portal also allows prospective patients to easily upload images themselves in just three quick steps and request appointments, making a large network of providers accessible to them in seconds. What’s The Deal With Big Data?